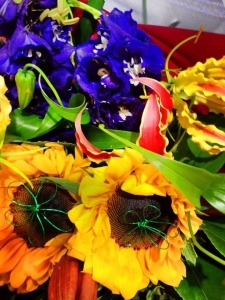 Looking for quality flowers designed with flair? Look no further! 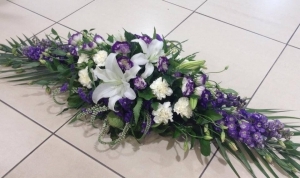 Whatever your occasion, celebratory or sombre, our talented team will design a floral masterpiece using top quality blooms.We specialise in creating contemporary, stylish arrangements, and pride ourselves on attention to detail. 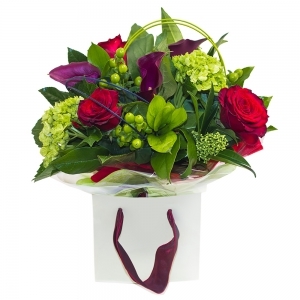 At Forget Me Not Flowers we love to create the perfect design using the freshest flowers for all occasions. Whether its an exqusite single bloom to say 'I love you' or elaborate arrangements for your special event, we're committed to delivering only the best in design and and quality. 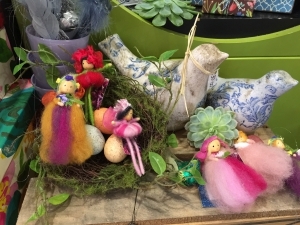 Pop in to see us in our beautiful store and enjoy a tranquill shopping experience amongst the flowers. We are located in Downtown Complex, Broadway Ave, Palmerston North. We stock a beautiful range of gorgeous giftware including specialty lines from French Country Collections. We offer same day local deliveries with our exclusive floral courier to ensure your bouquet will be treated with extra care. 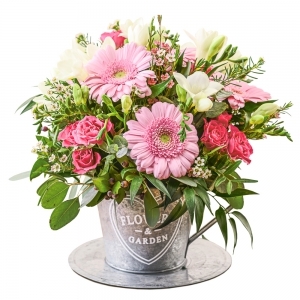 At Forget Me Not Flowers we are passionate about creating beautiful Flower designs and take pride in attention to detail. What we especially love is working with you to create beautiful wedding flowers. We have a step by step consultation process to ensure we create your dream flowers. Gorgeous, take-your-breath-away wedding florals are a must...They will feature in most of the wedding photographs and should reflect the look and theme of your wedding. Whether your requirements are simple and sophisticated or lush and lavish, we can design stunning arrangements to enhance your wedding. From the picture they looked fabulous and trust me if something was wrong with them I would have been advised . Thank you very much , cheers lenny. Excellent service. Delivered as soon as the order was received and arranged. The recipient said she couldn't thank you enough for the flowers. Thank you so much! 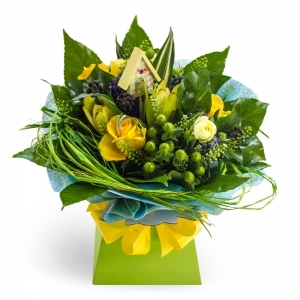 It is always a pleasure ordering flowers with Forget Me Not Flowers. I never have to second guess, or question anything - it is always sport on. It is such a great feeling to know without question that Forget Me Not Flowers will provide amazing flowers and service. Makes being so far from home just that little bit easier. Thank you from us all. The store went above and beyond to make sure our order was delivered. I am so grateful to know I can rely on Forget Me Not Flowers to fulfill our requests in the most professional manner, all the while retaining the personal touch. Thank you. Very good service and flowers were lovely so I hear. Very happy with the arrangement that was delivered on time and in perfect condition. <br/>A very happy recipient. No dramas. 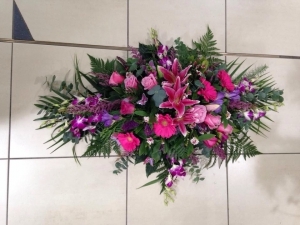 This delivery was for a family grieving and they were impressed with the arrangement and delivery. I haven't heard from the recipients yet so a bit soon to give feedback. Really nice to get the picture of the flowers. Stunning service from the florist, very accommodating and the bouquet was gorgeous. I'll be back. Wonderful professional service, the flowers were beautiful and well received. I was very impressed by the on time delivery (requested the following day when ordering at about 10pm). I really appreciated the description and photograph that I received by email the next day. The flowers were beautiful and appropriate - delighted that I went for the florist's choice option. Thank you. Brilliant service, was looking for flowers for a lady who is not the frilly sort and these were just perfect. Thanks so much. As a buyer not a recipient, my request is &quot;please send me a snap of the finished order, as it is nice to see what you are actually giving!&quot; My last order I was at the recipients house and saw the product when it was delivered. Mostly I am thousands of miles away. 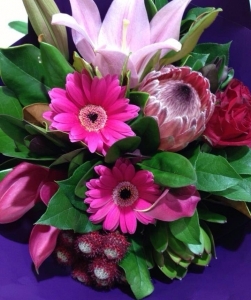 Great flowers, really appreciated receiving a photo of them before they were dispatched to the receiver. Great service! Ordered from the UK for next day delivery. Flowers were beautiful and exactly as the pictures on their website said they&rsquo;d be. The photo being sent to me of the actual floral bouquet was wonderful. I&rsquo;ve never received this when ordering from other florists. At a sad moment for my family i was so appreciative of service from delivering to a rural area and making the trip harder some roads were closed due to floods. I can not thank you enough and to top it off the flower arrangement was even more beautiful than i could imagine. Thank you for your efficient service. The gift brought real joy and looked beautiful. Fabulous service, and sending a photo of the flowers and card as part of order completion was a nice touch. The flowers were very well received and looked beautiful. Would recommend and use again. Thank you for the photo and note letting me know flowers had been delivered. Wonderful service???? 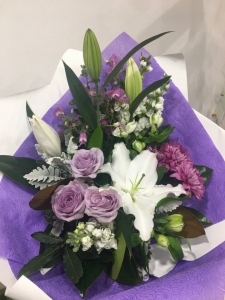 Would be a great idea to message clients especially those from out of town when flowers have been delivered maybe even with a pic of the arrangement which was delivered so that we know they have been received. Absolutely stunning. Well worth five stars. Will use the service if the need arises. Won't use the difficult-for-the-elderly website, though. Will telephone. Just as described. Fantastic service, fast delivery. Excellent service and delivery. The flower arrangement was lovely and appreciated by the recipient. My mum loved them.. and your delivery back-up phone call as she was out at the time of delivery. 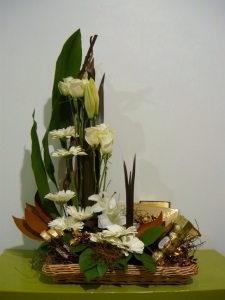 Fast, simple and always makes me look good with the amazing flower creations. Yet another great job from the team! Delivered on time and the flowers were lovely. Flowers were delivered to funeral on time and I am told by family members of the deceased that they were lovely! I was pleased to be able to send affordable and beautiful flowers to my family in NZ from the States. Thank you! Wonderful service and delivered fresh same day as ordered. Flowers were just what I ordered , have used this florist before excellent service and value for money. Thank you. Very happy with the service and delivery aspects! Great flowers Much appreciated. Ordering Internationally, I don't get to see the flowers being delivered. I really appreciated the flowers delivered photo. Very easy to order online and the recipient was very pleased. Thank you! These flowers were beautiful and I loved the hand written card. Thank you so much!! Ordered bouquet online, they were beautiful, my friend loved them! Fast, easy and beautiful service. Delighted. Quality service. Excellent communication throughout. I bought the floral teacup and fudge combo which was spot on for the birthday gift. A highly recomendable service. 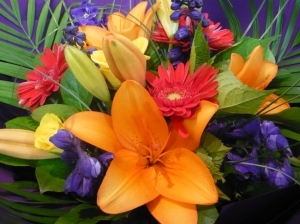 Beautiful bouquet from Forget Me Not flowers, Stunning colours and arragement. Also great communication from florist when flowers weren't allowed in a hospital ward, offering a simple way of delivering when the recipient was able to receive. Very happy to recommend to others, thank-you so much! Flowers were just fantastic nice and bright just what I ordered. Email sent when delivered wonderful service would use again. Thank you. Always a top quality service and excellent communication. Highly recommended to all. A seemless process from ordering to delivery - the flowers and additional gifts were lovely. Easy to use website, delivered as said, very nice delivery lady. Very happy to recommend A+ - Thank you! My mother was delighted with the flowers. Thank you. Super service and beautiful flowers. Very impressed!! Mum loved them! Beautiful and big real delight. Outstanding arrangement. The delivery was very prompt and the flowers were lovely. Service and communication top notch! 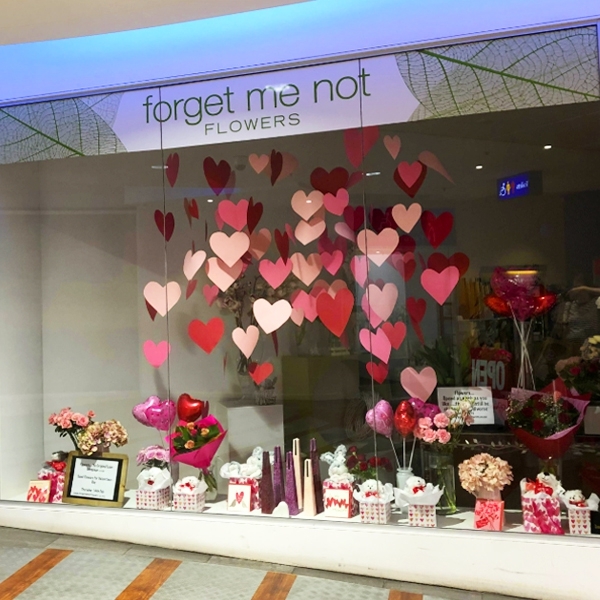 My Mum absolutely loved the flowers, balloon and fudge gifts put together by Forget Me Not Flowers. As my family lives in the UK, we really appreciated receiving pictures of the ensemble. Thank you! Excellent communication and organisation, and a beautiful product. Will definitely use your services again. Thank you. Florist took the time to hand write my note in a card which was a lovely touch. My mum absolutely loved the flowers. My mum was very happy. Thanks so much! Will be using again! Thank you very much! 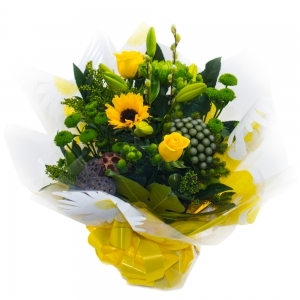 Delivered on time and they are beautiful, the recipient was so happy! Service was ok. They called&amp; left a msg to tell me due to public holidays delivery would be a day late which I appreciated but I could not return call as phone they called me on would not connect. Also, would've been nice to know when the flowers were delivered via text or email. I found out from a family member. Thank you once again for delivering a beautiful flower arrangement. Beautiful packaging, card and flowers, just perfect. Good boquet, loved by the recipient. Fantastic communication, went above and beyond. Beautiful flowers delivered on time - thank you! Fantastic service! Beautiful flowers! Love the follow up email showing the bouquet made up and confirming delivery. Thanks ! 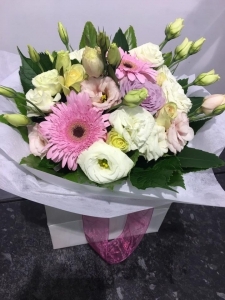 Excellent service, very professional, thank you 'Forget Me Not Flowers' - wouldn't hesitate to recommend your store and purchase from you again!! Fantastic service and assortment of flowers. Thought they could have walked them to her office, as she was across the street rather, than courier. Very easy to order from website. Most efficient service and recipient over the moon with the surprise delivery. Thank you for your totally awesome service, especially as I live on the other side of the world from the recipient. A++ service. Keep the fabulous work up. Booking of this service was seamless. I loved getting a photo of the arrangement that was sent. Delivered on same day whit no problem. Wonderful, awesome people to deal with, they went above and beyond what was asked for, not only were the flowers beautiful but the man who delivered them asked around the street to find the receiver when he was given the wrong address, he found her! Nice work, will be sticking with them for future orders! As usual, Alex and her team have produced an amazing gift. Many thanks. Fantastic service. I emailed the florist directly to confirm that they had received my order. Alex replied immediately and I got the feeling, they go out of their way to make the display beautiful. They love flowers and all they stand for. A joy to deal with from 3,000km away. Highly recommended. 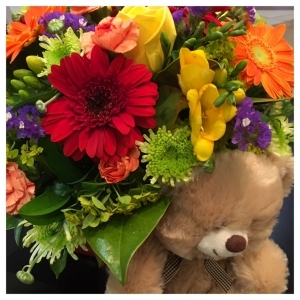 Wow - I am so impressed with Forget me Not Flowers Service - I have never received a pic of the flowers I sent telling me all the flowers they used - this is amazing service!!! Without doubt we will use your service again - love this touch - enormously appreciated! You rock!! Alex went above and beyond! My aunty was so blown away by the flowers she received. Such a seamless easy service all done from my desk at work in Wellington and delivered to my aunty 15 minutes out of Palmerston North. Delivered same day and of such high quality! The flowers were beautiful and exactly like the picture. Will use again! Thank you. Thank you for an easy and stress free delivery. 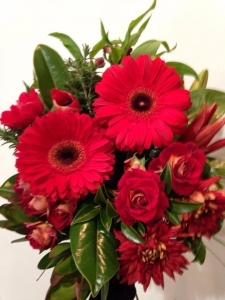 Such a good idea emailing a picture of the flowers to the customer before delivery - it's a nice touch. Forget Me Not Flowers have been remarkable and really gone above beyond in their service. I ordered the flowers from the UK and was not familiar with my husband's aunt's address. Unfortunately, it was not within the local Levin area, but Forget me Not looked into all sorts of solutions and liaised with the aunt and made it all work. They also, provided a special card and allowed me more than 240 characters. The flowers look wonderful. I cannot rate the service more highly and am very grateful for all the efforts made. I was at the funeral and saw the flowers that were there. I could not see who they were from because all the cards were in envelopes. I thought the lily and peach roses were the most beautiful. I now see they were from me. Thank you. Once again Alex & team, from Forget Me Not Flowers, provided an excellent service. The flowers looked amazing. My beautiful, brave little sister loved them. Plus such a bonus to receive photographs of the finished product. I don't know of anyone else who does this. Special thanks to Alex. Appreciate the extra effort. Highly recommend. Very prompt delivery service even though ordered late afternoon. Much appreciated. Gorgeous arrangement, thank you so much. Forget Me Not Flowers sent a beautiful bunch of flowers to my Mum for her birthday. They went out of their way to deliver them, which we really appreciated. Mum said to pass on, how beautiful they were and for the extra special delivery. Would definitely use Forget Me Not Flowers again. Recipient was thrilled. 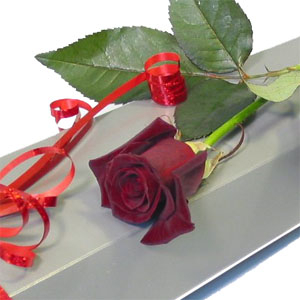 The products where everything promised and more which is a pleasant surprise for online flowers. Well done and keep up that standard and your business should thrive???? Beautiful flowers! I loved the extra detail in the presentation. I also loved receiving the email with a list of what was put in the boquet and the photos of the ACTUAL boquet, not just a standard one. Great personal touches! Thank you. Great service and beautiful flowers. Went above and beyond for me. Much appreciated. The wreath you sent to my family on my behalf was absolutely beautiful. It was even better than I imagined and I am so grateful. I am on the other side of the world unable to be with my family during a time of grief and this small token made me feel like I was able to be part of it in some small way. Your prompt delivery and follow up email including photos was also greatly appreciated. Thank you so much. The delightful Alex went to special lengths to ensure that our order was looked after. We had supplied the wrong phone number and that made things difficult for her. When that was sorted, Alex took extra trouble with the order and left us and the recipient very happy indeed. Delivery same day as promised - the recipient was pleased with the flowers but I have not seen them so the rating may well be excellent! Thank you, your delivery looked beautiful. This was for a dear friend who went back to New Zealand after living in Australia for a number of years. The ordering was so easy, I will use your company for future gifts. Above and beyond for the customer. They look absolutely beautiful and included the friendship rose, which is so fitting. Thanks A Million! Most helpful. The Hospital ward did not allow fresh flowers so they offered to put my order on hold until she was moved back to her rest home. Worked well. I messaged the florist from England requesting advice re arranging funeral flowers and I was messaged back almost immediately despite it being 7.20am in NZ! Alex was so helpful in every way and offered great advice re what flowers would be best. It was great that she sent me photos of the arrangement as I got to see them despite being on the other side of the world! I would highly recommend this florist, amazing service and beautiful flowers. The flowers were beautiful and I was especially impressed to receive both a description and a photo of them. Would use this florist again as well as highly recommend them to others. The florists were very helpful especially when I changed the day of delivery and then the delivery address! They emailed me to reassure me the changes would be made and delivered on time. My cousin loved the flowers I sent her. Beautiful flowers as described and delivered the time requested. Thank you very much and would definitely buy from again! Beautiful flowers, will use again. Excellent Services and customer enquiry services. I'm very happy with the standard and presentation of the products sent. Will definitely recommend them. Flowers arrived on time. Was told they were beautiful. Would have loved to send a living plant to this person, maybe a rose bush etc, didn't see this as an available option. 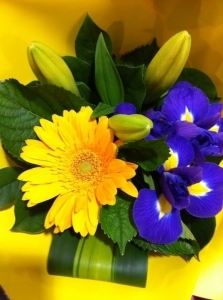 The recipient was delighted with her flowers, and I did appreciate the photo of what was sent. Thank you. Absolutely wonderful - gorgeous flowers - service impeccable - even sent me a pic and let me know what was in the arrangement. I was very impressed. Nice selection. Very efficient service - provided a photo of what was delivered. Exceptional service from order right through to post delivery. 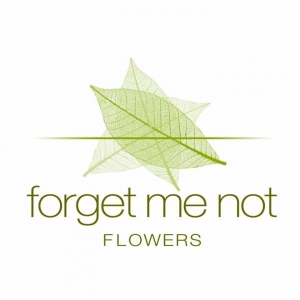 I am so impressed with the systems the team at Forget Me Not have put in place. It made ordering flowers from Auckland so easy. There are 'online orders' and then there's 'online orders'. The simple and smart things you guys do, along with your beautiful flowers easily set your team and company apart. Thank you. Perfect service and I love that I was sent a pic of what was sent. Would absolutely use again. Very easy to organise and fast service. I really liked receiving the feedback re delivery and a picture of what had been sent. This is the second time I have used Forget me not flowers. Both times they have deliverered a great service, very quick delivery, beautiful flowers at a reasonable price, and are very communicative throughout the whole process.. Couldn't recomened them enoough! A great little delivery gift, and also an easy to use and informative booking site. Forget Me Not Flowers were fantastic. 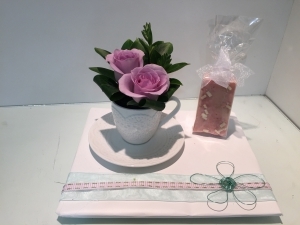 They described the flowers that had been sent in the 'teacup' and thoughtfully included chocolate fudge rather than some hard ones as they knew from the card the recipient was elderly. Later I received a photo of the arrangement and confirmation a GST invoice had been arranged. Thank you for the most lovely bouquet! They look beautiful and the colour combination is amazing! I believe the flowers were delivered on time, with courtesy and the recipient was well pleased with the choice. However, I specifically chose this florist as your feedbacks from other buyers said they sent an email showing the flowers delivered. I haven't received this email. See above? Such a wonderful and thoughtful florist! I was so thrilled getting a picture of the bouquet I had ordered and a video of my niece receiving her flowers. So very kind. Thank you!!! Great service! Fast, efficient and good communication! thank you! They were gorgeous and he loved them! The bunny card was a cute touch and you guys rock!!! I am so happy with Forget me Not Flowers. I love that they took a photo of what they delivered and sent it to me as the purchaser. They also added a personalised occasion card which was pretty cool and took the time to tell me about the flowers they had provided. Awesome Service! The flowers were lovely and I was really impressed. I have been to this florist before and they are amazing every time. I have chosen them again for my flowers for our wedding anniversary! I was very impressed by the presentation and the way all was done as I requested. <br/>Would have no hesitation in using them again. 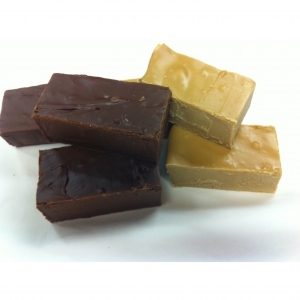 The product was delivered on time and was very nicely presented, as good, if not better, than the picture. Thank you! Great flowers and great follow up. Thank you so much for your effort and time to make sure my order was delivered on a saturday....and on your day off!! Very much appreciated!! :-) My aunty loved her flowers I would definitely shop again at Forget Me Not Flowers!! Excellent service. Quick and easy ordering. Thank you. My wife was very happy with the quality of the flowers and arrangement. Thanks! Beautiful bouquet. My mother was really happy to receive them. Thank you so much, Very easy to order and great service... 5 stars!! Had to phone in the end to send multiple orders and the staff were absolutely delightful. Friendly, helpful and adding suggestions for me. Couldn't fault them. Forget Me Not Flowers has provided very personalised service including a phone call to sort out extra details. Flowers delivered on time and were excellent. The flower arrangment looks very pretty and a good representation of New Zealand. Thank you, we love the fact you send us a picture of the bouquet. Fantastic service, loved getting a picture and description of exactly what was delivered. Well done. 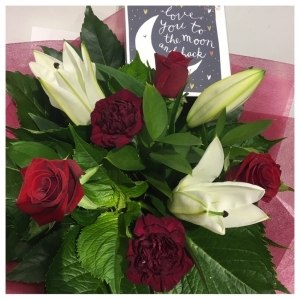 I was very happy with the prompt service and email confirimg delivery., Sending me a photo of the flowers was a lovely touch - they look beautiful. Thankyou! 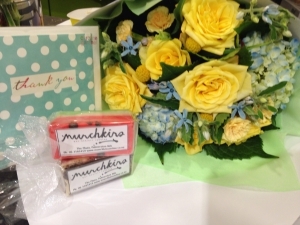 Thank you for the lovely presentation and for same day delivery. 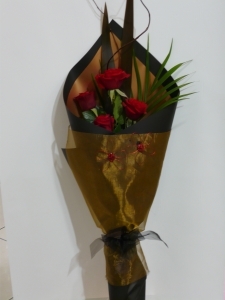 It was also a pleasant surprise to receive the delivery confirmation with a picture of the arrangement. Great service and so nice to receive a description and photo of the bouquet. Thank you. Wonderful personal service and beautiful flowers. The recipient was over the moon with her surprise bunch! Would definitely use again. Beautiful flowers and fast service. Just beautiful flowers and service. Would definitely order through Forget Me Not Flowers again! Thanks so much!! Appreciated the personal service that was needed in placing my order; their response to my order was fast and efficient and my request for spring flowers was filled to my expectations. Would use again. Flowers were gorgeous. Very easy to order. Thanks. Beautiful arrangement. The follow up email that included a picture of the flowers was appreciated immensly. Will definitely use this florist again. From the moment I spoke to the florist in Palmerston they could not have been any more helpful and kind. The flowers are beautiful and I appreciate the extra touches and above and beyond service. Thankyou very much. I placed an order around 1pm and they delivered within a few hours. They also ensured that my special requests were noted (softer tones, no lilies) and came up with the lovely flowers as noted in the picture. I really appreciate that they followed up with a response and a picture of the end product. Oh what a wonderful basket of goodies for my sister. Well chosen. She is thrilled. Thank you. Beautiful flowers yet again and I have highly recommended them to my family and friends in New Zealand. Best florist I have ever dealt with! Hands down would not hesitate to use again and recommend. Great service. Nice flowers and prompt delivery. Great service, they have always been a superior florist in PN. Beautiful flowers delivered super quickly. Thank you. Recipient very pleased, thank you. Excellent personal service. I rang to confirm delivery could be made to a rural RD5 address. They rang the courier to confirm &amp; all was successful. I made this phone call (international) because another florist stated Rural deliveries were included in their service. It took 2 days to inform me via email that they did not deliver to the area I wanted. Unfortunately it was too late to reorder else where &amp; they credited my account. So all in all this florist was superb and I rate them &amp; the lady I spoke to 10 out of 10. Teddies where only indicative, but thought, having one laying on tummy and two sitting, in picture, they where available. I asked for a laying teddy, THEY DONT HAVE ANY! but young lady when I phoned may try and source me one - lets hope so, website was a little misleading. Young lady on phone was most obliging,lets hope flowers and teddy are what I ordered. Easy to submit order. Delivered ahead of schedule. Person who received the delivery said they were absolutely gorgeous. Great contact re delivery. Flowers were exactly what I requested. Lovely friendly and knowledgeable lady. Living in Canada I love the fact that you send me a picture of the bouquet you send out. It's so easy to order. <br/> <br/>Thank you. You were quick professional and did a great job- thank you! Would not hesitate to use them again THANK YOU !!! Great service, the florists had to redeliver and were really helpful to make sure that the flowers arrived on time! Recipient was really happy too. Fantastic fast service! My friend absolutely loved the flowers! Gift arrived day late. Send gifts regularly in New Zealand &amp; first time this has happened. Will probably not use service again. The flowers and communication from forget me not flowers was impeccable. Excellent service, delivery and a phone call which I appreciated. Mum loved her Christmas flowers in the basket. They have lasted well and reminded her everyday that we were thinking of her. They were delivered very quickly after ordering. Thank you! I was really impressed with the photo taken of the bouquet and the note telling me what you used in it. Great service and follow up on what colour choice i wanted. Would like a text or email to say flowers have been delivered. Flowers were beautiful and delivered on time, thank you! The florist did beautiful flowers which my daughter loves. She was a great communicator and went the extra mile to make sure everything was perfect. More than happy. She was fabulous plus!!!! Extremely prompt delivery and great to receive a photo of the boquet so I knew what was delivered. Thanks! Flower were beautiful and delivered on time. Will definitely use again. I appreciated receiving a photo of the actual delivered item. It was perfect for the occasion and delivered on time, in good condition. Many thanks. My sister was very surprised and very pleased with them. Great to get a photo of what you sent. Beautiful flowers, and used buds that would flower a couple of days later when the event was to occurr. It's was only 1 flower. But you made a little girl's 6th birthday extra special. Thanks for making me the "cool aunty"! Very satisfied with the flowers that were delivered; more importantly my mother loved them! I ordered the flowers late notice and only a couple of days out form Mother's Day. Impressed that they accepted the order, also the colour scheme I wanted was sport on and even delivered it on the Sunday at the requested time. I'm sure that day was one of the busiest times of the year, so I really appreciate all the effort they did with last minute notice! Would definitely use the service and this florist again. Delivered on time & my Mum loved them. Thanks. just wanted to thank the florist for the phone call about the flowers and the beautiful bouquet that arrived. It was a fantastic service and I will highly recommend them and this service to all my friends here in the UK. Thank you for making a sombre moment bearable. The flowers were for my son's partner who had just given birth to our grandson. She said they were beautiful. My New Zealand cousin said her flowers were lovely. Thank you so much. Really appreciated your swift and beautiful bouquet. It made someone's day and that's a great thing. Forget Me Not Florist did a fantastic job with the flowers I ordered. The accepted my specific instructions and created a beautiful arrangement. I couldn't be more pleased! the best service I've ever had. terrific, caring and lovely people who went the extra mile. Great value and delivered on time. My sister was delighted with them. Perfect!!!! Im sitting in Germany and I ordered the flowers for a good friend!!!! They arrieved in time!!!!!! So, I will do it again!!! Thank you so much - the service was brilliant - my mother was very impressed with the bouquet and the delivery was perfect. The florist who delivered the flowers rang me to make sure the flowers I wanted were to be all one colour. Very good service. I asked for something a bit different to the pictures, a bit brighter colours instead of softer colours. I did not expect to hear from them but they made a call to discuss possible flowers. Much appreciated excellent service. Thanks, will definitely use again. A selection of beautiful flowers using the best blooms of the day. Price includes small card and delivery fee. Tea cup and saucer with florals and delish munchkins fudge. Perfect for someone that loves flowers and a sweet treat with a cuppa. Price includes a special card and delivery fee. Flower variety is subject to availability, please request your preferred colour in the special instructions. 4 gorgeous Roses, presented in a stunnning wrap with organza and lush foliage. Colour and flower variety subject to availability. Price includes card and delivery. A box of 6 handcrafted Chocolates. 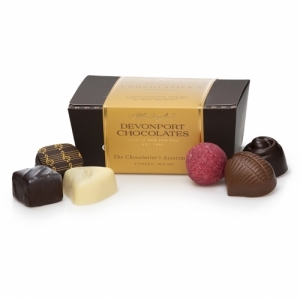 Every chocolate is handmade by devonport chocolatiers. 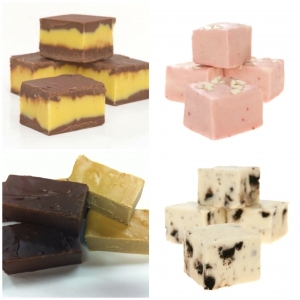 Flavours included are raspberry honey bonbon, chewy caramel, chocolate extreme truffle, tropical lime, hazelnut praline and vanilla cremé. Box measures 11 x 7 x 4. 5 cm. Gluten, alcohol and egg free. Only available additional to flower purchase. 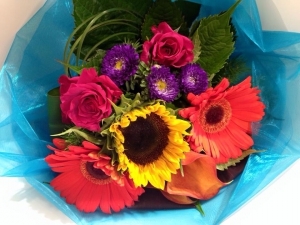 Bright breezy blooms. . . . Price includes a card for your message and delivery. 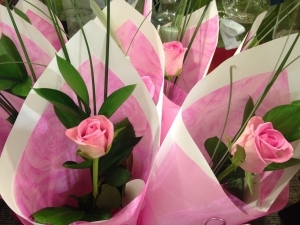 Some flower varieties May be substituted due to seasonal availability, especially at peak trading times. Image pictured is the Medium size. A Traditional bouquet including beautiful white, cream and lilac hues. Price includes local delivery and a special gift card. Flower varieties subject to seasonal availability. 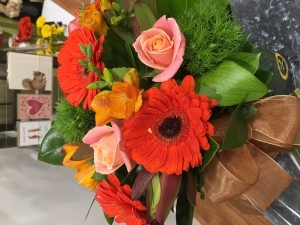 Lush Posy of Peach orange and apricot tones with beautiful green foliages. Price includes delivery fee and gift card. 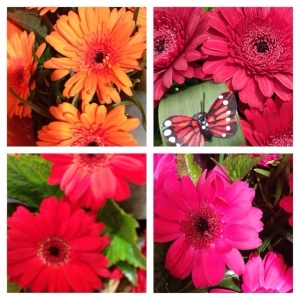 Happy Gerberas and Happy Butterflies arranged in to a beautiful Bouquet with lush foliage. Price includes delivery and a special card. 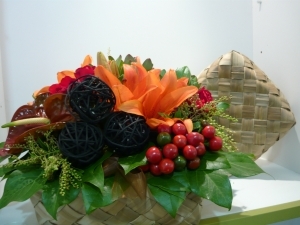 A long lasting design of flowers and foliage arranged into a woven flax basket. Price includes delivery fee and size pictured is medium size. 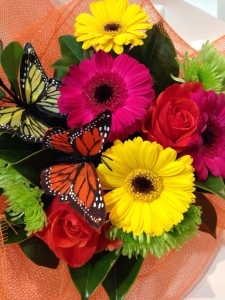 Beautiful bouquet to express your empathy. 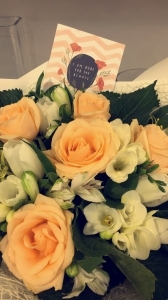 . . . . Soft apricot and white bouquet and "I'm here for you always" card. Price Includes special gift card and delivery. Single Gerbera with lush greenery presented in a beautiful wrap. Please specify colour in special instructions and we will do our best. Available in orange, red, yellow and pink. Price includes delivery and small gift card. A traditional wreath of soft florals represents eternal life. 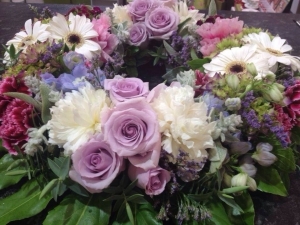 A beautiful arrangement of purple and white flowers.